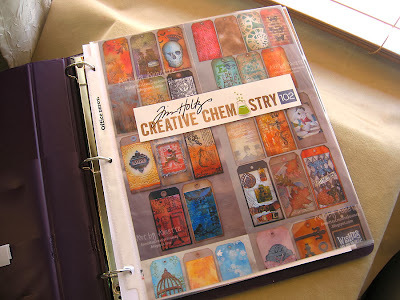 Annette's Creative Journey: Creative Chemistry 102 Notebook & Give-away! 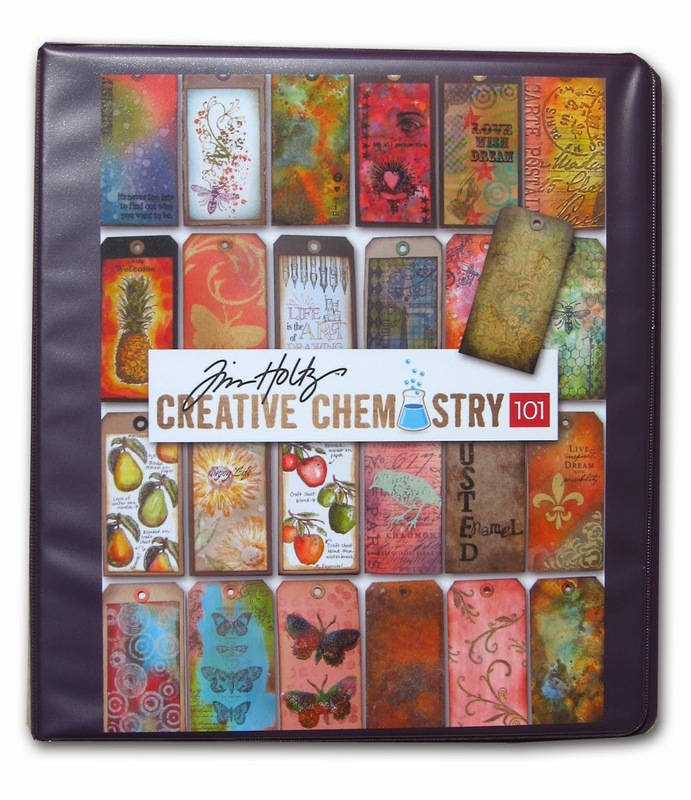 Creative Chemistry 102 Notebook & Give-away! 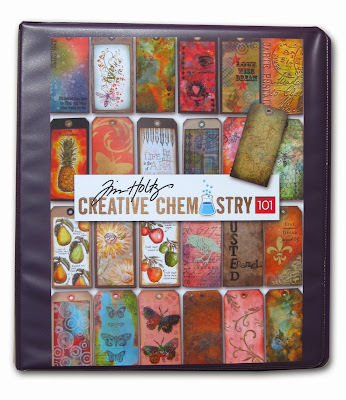 I quickly wanted to share my notebook that I started with Creative Chemistry 101 and now have altered slightly for 102 and CC courses in the future. 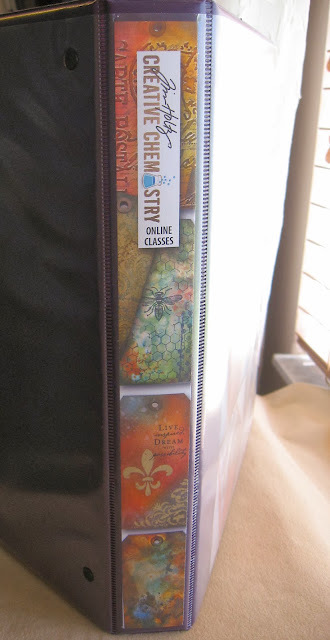 Here's a look at my 101 notebook when I first put it together back in 2012. See link for more photos and details. Since adding 102 to the coursework, I moved this front insert photo to the inside of my notebook. This page was created in PhotoShop Elements. I created a similar page for the 102 section. Each one is inside a page protector which makes a great divider for the sections. 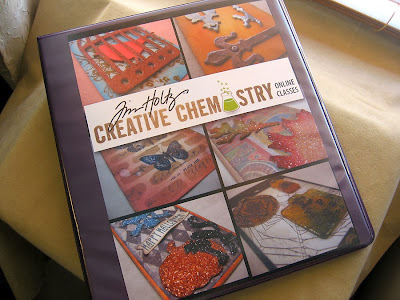 Then I created a new cover so that any future Creative Chemistry courses can be added. Same with the spine. Same one from last time, only I changed the 101 to Online Classes. 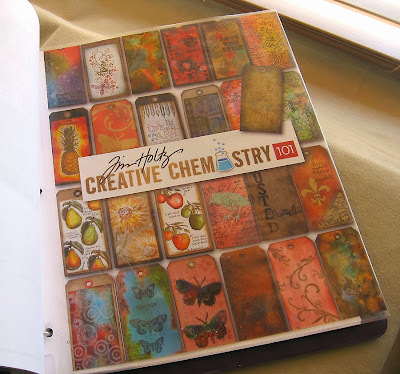 As for the tags themselves, I am going to create mini books using Tim's Worn Covers/Composition Book like he showed in the 102 follow-up video. What a fantastic idea! I'll be sure to share those books when I finish them. I really, really like every card you did from today's class. Now Shirley, just e-mail me at AnnetteGreen@me.com with your mailing address and I'll get this happy package off to you ASAP. Congrats Shirley! Annette, thanks for sharing your binder for the cc classes. Great to have that all in one spot. When my life isnt so busy, like after the holidays, ha ha, I'm going to sign up for these cc classes. Have heard such great things. Looking forward to seeing your worn cover books with all your tags. super creative binder. Love your inspiration. Great binder, Annette! Mine are on a book ring. Yeah, I'ma simple girl!! Congrats to Shirley on the win! Love your binder! Great idea. I'm sure there will be more. The Man is a master. How sweet of you to pick someone from your lovely comments. Congrats, Shirley. Keep the inspiration coming, Annette! I love your work!! Sick of Halloween? Don't read this post. Creative Chemistry 102 & a Winner!